The real estate industry is all about relationships. In today’s internet-driven world, they’re cultivated online as much as in person. Keep your agency one step ahead with flexible, online real estate training. When a new agent joins your firm, you want selling properties and generating revenue as quickly as possible. That has to be built into your onboarding process. The best way for new agents to hit the ground running and start generating revenue is to cultivate leads. It’s the only way they’re going to make sales, yet, often, it’s neglected in their initial training. A study by Inman has found that almost half of respondents considered lead generation a topic crucial to the success of onboarding of real estate agents. Still, too many new agents focus their energy on marketing. Instead, they should be proactively building their client base. AdaptiveU can help you onboard for success. Create “universities” – online training portals – tailored specifically to new-hires, prioritize learning with step-by-step guides that start with the real estate fundamentals, and challenge your new agents with tasks that focus on lead generation from day one. Give employees the best possible start with AdaptiveU. Real estate is all about relationships, whether it be with a buyer, a seller, a loan officer, an appraiser – the list is endless. In the past, the only help at hand to manage these relationships was an overworked rolodex. Thankfully, times have changed. Your agency might be taking advantage of Customer Relationship Management (CRM) software, like CINC, to manage your leads. But CRMs can be complex, especially for agents who are new to them. With AdaptiveU, you can turn your agents into CRM experts. You can add challenges that allow them to learn your preferred CRM at their own pace, from offering a general overview, to a ‘How to’ series on using specific features. You can even make it mandatory that your agents rate and review these challenges, to ensure that they’ve understood and remembered important CRM tips. Don’t let a relationship grow stale because of your team’s tech-phobia. AdaptiveU can be the cure. It’s hard work, earning a real estate license: learning the law, putting in the classroom hours, passing the state licensing exam. Once a person has successfully completed that process, they’re officially ready to sell property – but you know the learning doesn’t end there. Even when your agents have a license, they have to work to keep it. Maintaining a license to sell real estate in the US relies on relearning. Every year, your agents have to re-educate themselves in order to keep abreast of state and national changes in both law and procedure. The success of your business depends on it. AdaptiveU was built to support continual learning. You can create regulation pop quizzes that your agents have to pass, assign points per challenge and set a minimum weekly threshold, and allow agents to be admins so that they can add their own challenges, and share their knowledge of any changes you need to know about. In real estate, it’s crucial to stay ahead of the curve. 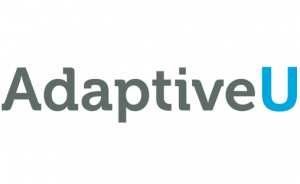 AdaptiveU provides the platform, you do the rest.